"They can come in later, they can all come in later...but, now, I want to be alone." Love and Anger is a collection of five stories that are the handiwork of directors that have made names for themselves in decidedly different ways among the annals of foreign cinema. The heavy hitters of the time are all on board, including Bernardo Bertolucci (The Last Emperor, Partner), Marco Bellocchio (Devil in the Flesh), Carlo Lizzani (Requiescant), Pier Paolo Pasolini (Salo), and, a huge treat, the legendary Jean-Luc Godard (Band of Outsiders, Breathless). Most of these films are extremely surreal, but they all have political undertones. This actually works out quite well, as even if you aren't familiar with the political climate in Italy and France during the 1960s, you can revel in these masters' liberal use of inventive imagery, much of which never comes completely together in a standard narrative structure. The actors come from a pair of renowned theater groups: the Living Theater and Andy Warhol Factory, and include Julian Beck, who made his mark in Hollywood as the creepy preacher in Poltergeist II. Each filmmaker is at the reins of one of these short films, with Carlo Lizzani handling L'Indifferenza. This tale is only about 12 minutes long, but is also the best. It's amazing just how many intersecting stories come into play in such a short time, but we initially see a woman who is stabbed to death outside an apartment while her neighbors do nothing to help. We then see an injured man asking his wife for help after an auto accident, as a reluctant driver is asked to help out by the police. The performances here are outstanding, but the film's shining point is in its gritty appearance and overall sense of dread, and it delivers an important moral message that has stood the test of time. Agonia is directed by Bertolucci, and is much longer (about 30 minutes) and paced more slowly than the first entry. It is still very interesting though, if only for the chance to see Julian Beck in something different, and he gives a fine performance indeed. This is basically an experiment in avant-garde theater, with the director employing members of the Living Theatre troupe to pretty much do their thing (including meditation, violent reenactments, etc.) around a dying man (Beck). If you can bear with the sheer strangeness of this piece and it's languid pace, it does have its rewards, despite its flaws. Next is La Sequenza del fiore di carta by Pier Paolo Pasolini, my least favorite segment. This is basically Ninetto Davoli walking down the streets of Rome just being annoying, while we see stock footage of historical figures whose legacies centered around various wars and other violent atrocities in which they played a major part. L'Amore is from Godard, and this legendary filmmaker delivers a worthwhile film yet again. The his piece features a pair of couples; one that talks about various issues such as war, love, and politics, while the other pair is actually talking about what has transpired in the film to this point. Godard adds his usual visual flair to the proceedings, which often make up for some rather bland dialogue. The last short is Discutiamo, discutiamo, helmed by Bellocchio. This ultra-political film attempts to be as real as possible by using student actors from the University of Rome. The director keeps them in their natural habitat by setting the picture in a classroom, focusing on a heated debate between vastly different members of the university. The main problem is that there's really not a single actor we can get a hold of and root for or against throughout the picture. Unless you're really attuned to the politics of the time, this short, in particular will leave you lost about the subject matter. Image Transfer Review: The film shows up in a remarkably refurbished 2.35:1 anamorphic widescreen transfer. There's still some grain that pops up from time to time, but this and the numerous specks of dirt that have appeared on previous home video releases have almost been eliminated entirely. The specific details of the transfer vary from time to time, but L'Amore and Agonia benefit from slightly more impressive image detail and sharper images. Blacks and contrast levels are solid throughout the anthology, aiding a grand color scheme that really shines on this DVD. Audio Transfer Review: The original Italian mono track is offered, and it does a great job presenting the film's sound in as grand a fashion as this audio format allows. There isn't much dynamic range, given the inherent nature of mono, but the music and sound effects do sound surprisingly rich and full, and are worked-in well with the clear dialogue. Extras Review: This is a two-disc set, but the only extra feature (aside from a poster and still gallery on Disc 1) is featured on Disc 2, in the form of Behind Love and Anger. This extensive 77-minute documentary features interviews with directors Marco Bellocchio and Carlo Lizzani, assistant director Maurizio Ponzi, and editor Roberto Perpignani. These gentlemen discuss their hand in making Love and Anger in great detail, with the most in-depth talks being those with Bellocchio and Lizzani. 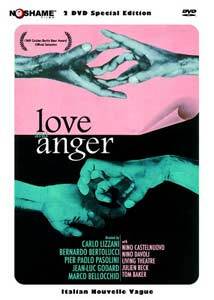 While there are a couple of these shorts that miss the target, in all, Love and Anger is a solid anthology featuring some of the best foreign filmmakers of the time. With the simultaneously released DVDs for Love and Anger and Partner, No Shame is making a huge splash among classic foreign film distributors.